I thought as I did these that they felt very different from the ones I did last year at this time. Last year's were on a bed of sand. What a difference a surface can make. 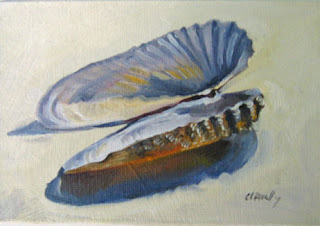 I sold those little angel wing paintings as a set for 30.00 a piece at a show on the boardwalk...maybe I can do that again this year. 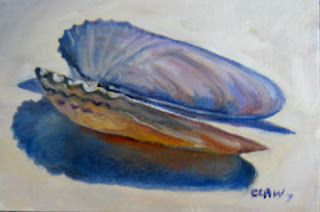 They're one of my favorite shells and fun to paint. It's been raining cats and dogs around here, so I needed to work inside. More flowers later. New Cottage Painting... "Causeway's End"